Last summer we discovered a roasted potato salad recipe with paprika and rosemary and Dijon mustard, and we made it at least five times. We obviously both enjoy it, although we tend to prefer sweet potatoes over white potatoes. 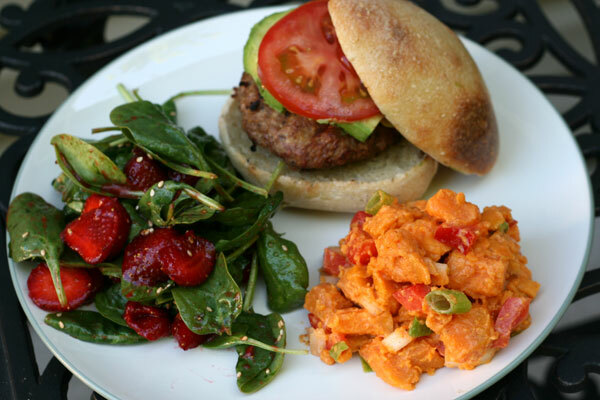 So this summer we figured that we better add a sweet potato salad to our picnic repertoire. This recipe was inspired by Pat and Gina Neely (whose show I don’t particularly like, but whose food usually sounds so comforting and appealing). In addition to the sweet potatoes, the salad includes red peppers, onions, scallions, and parsley with a sauce of mayonnaise, orange juice, and spices. Pairs nicely with a turkey burger and strawberry-spinach salad! What’s your favorite summer picnic salad? Add sweet potatoes to a large pot of cold salted water. Bring to a boil over medium-high heat and cook potatoes until tender, about 15 minutes. Drain and cool completely in a colander. In a separate bowl, add mayonnaise, orange juice, smoked paprika, cumin, cayenne pepper, and salt; whisk to combine. Pour dressing over potatoes and mix thoroughly. Refrigerate for 1 hour before serving. I’ve never made potato salad with sweet potatoes before. What a good idea! I prefer sweet potatoes over white potatoes also. This looks light and perfect for a picnic! I’ve never thought to make a potato salad with sweet ones! What a good idea. This looks awesome! P.S. I always think its so interesting to hear what food network stars other people like and don’t like! I’m not really a Giada fan (though I totally get her appeal), but I LOVE the Neely’s. So funny! We love sweet potatoes over white potatoes so I’ll definitely have to remember to give this a try. It is fun to prepare them different ways because I get so bored with oven/microwave/fry versions. 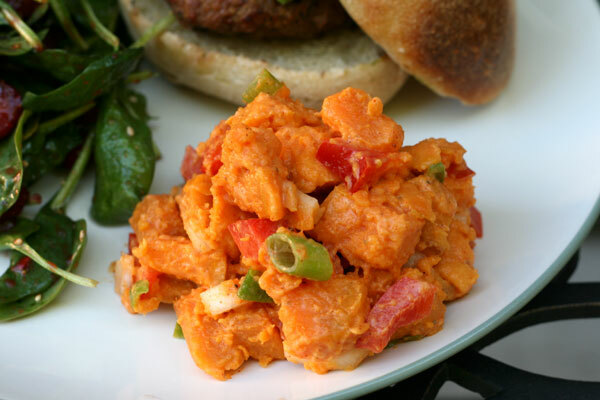 I made the sweet potato salad when I invited Jim and Vicki over for lunch. We loved it. Jim finished the whole bowl! He thinks this should be another grandma favorite. I made a version of this with sweet potato, onion, asparagus, pineapple, paprika,salt,pepper, parsley and a small amount of chili powder. I used mayo, sour cream and pineaplle juice for the dressing.